Israel's Prime Minister Benjamin Netanyahu says Brazil moving its embassy to Jerusalem is a sure thing. Israeli Prime Minister Benjamin Netanyahu says it is only a matter of when not if Brazil moves its embassy to Jerusalem. Brazilian new organization UOL is reporting that Netanyahu made the statement Sunday during a meeting with Jewish community members in Rio de Janeiro. 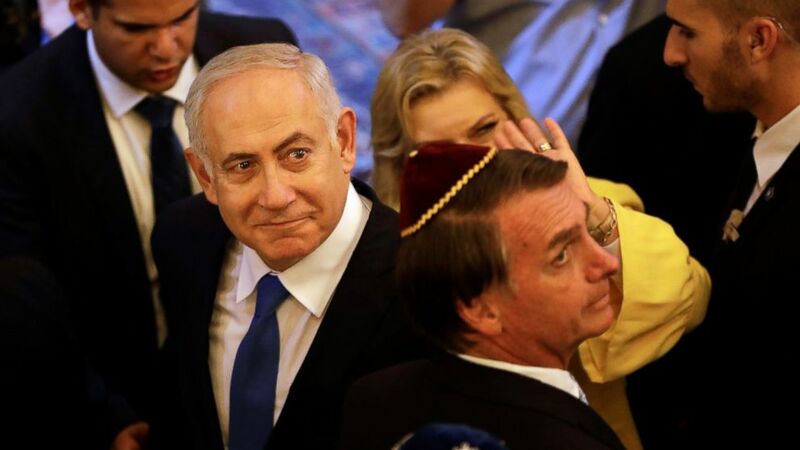 Netanyahu is in Brazil to attend incoming President Jair Bolsonaro's Jan. 1 inauguration. The prime minister stopped a few days early in Rio to meet with Bolsonaro as well as members of the local Jewish community. Bolsonaro announced on Twitter last month that he intends to move the embassy from Tel Aviv to Jerusalem once he is in office. Several Arab states protested the announcement, threatening to boycott Brazilian goods. So far only two nations have moved their embassy to Jeruselum, the United States and Guatemala.